Joseph Hopkins Millard was born in Hamilton Ontario Canada on April 20, 1836 and died on January 13, 1922. As a child he moved with his parents to Iowa eventually living in both nebraska and montana. In 1864 he opened a bank in Virginia City, Montana, He returned to omaha two years later to become director and president of the Omaha National Bank. He became involved in the railroads, being an incorporator for Omaha & Northwestern Railroad Company in 1869 and director of the Union Pacific Railroad Company. He was mayor of Omaha for 15 years and served one partial term as senator from Nebraska from 1901 to 1907. 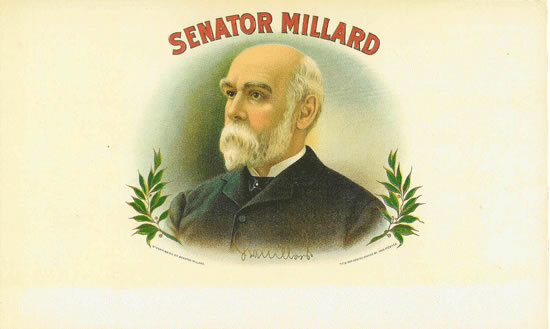 As this cigar label states By Permission of Senator Millard it dates it somewhere between 1901 and 1922.